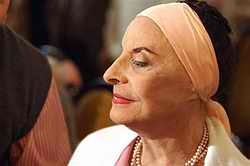 Mexico, through Merida Mayor Cesar Bojorquez, presented Cuba National Ballet (BNC) Director Alicia Alonso the Guest of Honor Gold Medal. Mayor Bojorquez said the medal acknowledges her title of Prima Ballerina Assoluta and her long career heading the BNC. The BNC is presenting Don Quixote at the Cathedral Square with first dancers Viengsay Valdes and Elier Bourzac in the leading roles, while Anette Delgado and Javier Torres will be lead dancers on February 27.